The Vancouver Audio Show will be returning to the Hilton Vancouver Metrotown, taking place from the 24th – 26th June 2016. Our original choice of venue received such a great experience overall it really wasn’t a difficult decision to return. With its easily reached location in Vancouver, experience all that the Metropolis at Metrotown has to offer when you stay at Hilton Vancouver Metrotown. The Metropolis is British Columbia’s biggest shopping and entertainment complex. The Vancouver Sky Train is only yards away, ensuring the attractions and businesses of downtown Vancouver are within easy reach. But if the attractions of the Vancouver Show are enough for you there is the innovative Reflect social dining + lounge, which is the ideal place to catch up with friends or colleagues. This Metrotown restaurant serves an excellent Hilton Breakfast in the morning and provides a sophisticated menu of fusion cuisine throughout the day. A complete list of directions to the Hotel are listed on the Hotel website, click here to view. 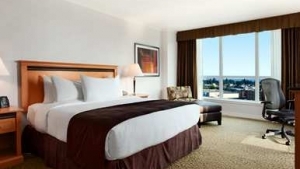 There’s no better location for your weekend group than the Hilton Vancouver Metrotown hotel. Located within walking distance to the largest shopping mall and entertainment facility in British Columbia, all Guests will be overjoyed with the services this hotel offers. In addition, the hotel is steps away from many restaurants, parks, and SkyTrain transportation to downtown Vancouver. Outdoor enthusiasts should plan a visit to Deer Lake to explore its numerous walking trails, boat launch, playground, Burnaby Art Gallery, Shadblot Centre for the Arts, Burnaby Village Museum and Century Gardens. Central Park, located a block from the hotel, features a children’s playground, outdoor pool, tennis courts, walking trails and is suited for people of all ages and fitness levels. There are no local attractions for this show at the moment. Please check back soon.